View from the Birdhouse: Dear Abby - Welcome 2016! Dear Abby - Welcome 2016! Happy New Year! I am excited about a new year to visit with you here on Fridays. For readers who are just stopping by the first time, my name is Abby, and I am a 6 year old Dachshund/Jack Russell mix. I'm rescued and live a happy life with my Momma. I blog each Friday with pictures, dog theme book reviews, dog videos, vintage dog illustrations, and questions from readers. I have a couple of new photos to share with you. This is me on Christmas night, snuggling up with my new lovies. I carry my plush toys around and cuddle with them like little teddy bears. They make me happy! Here I am in my new harness. It is covered with Valentine hearts! 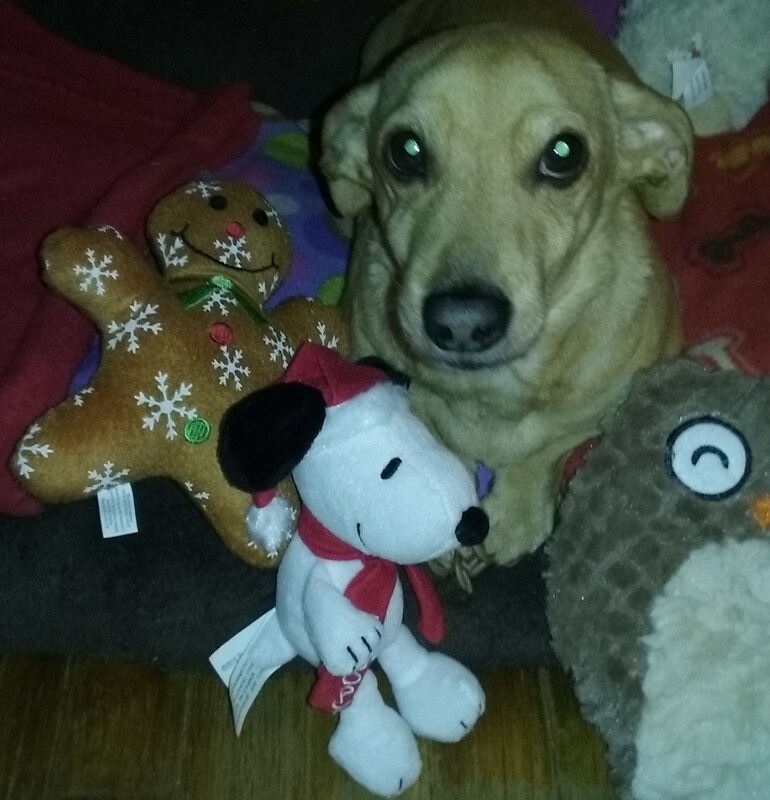 This was a special Christmas gift, and was ordered from Dachshund Delights. 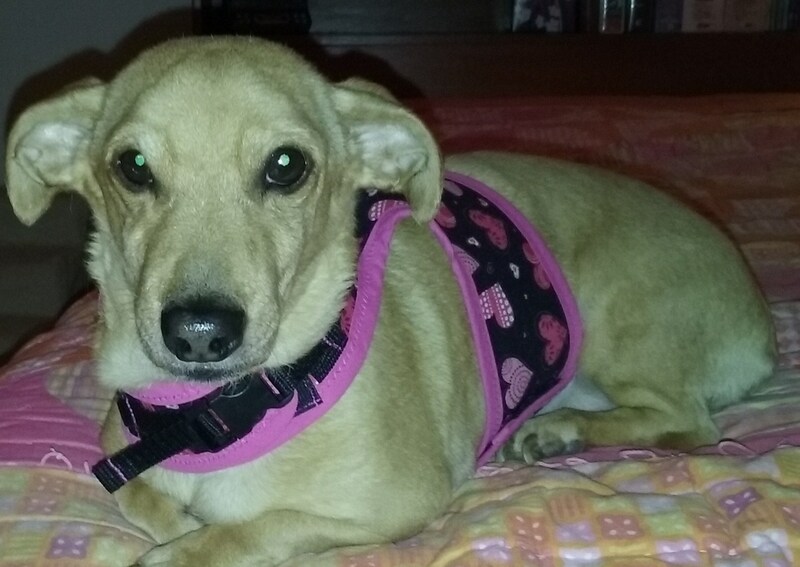 They make these harnesses to order in your choice of pattern and trim. They are very sturdy. This has mesh lining inside. Momma says I like to pull on leash (as if this is a bad thing!). I wriggle a bit less in a harness like this. Now, I would love to hear from you! How were your holidays? If you have furbabies, dogs or cats, how did they celebrate? Do you have any questions that you would like me to answer here? I am happy to answer dog questions, pet questions, fun questions of any type ... just send them in! You can talk to me in the comments, below. Love and a happy 2016 to you! Abby, you are such a little darling. Sounds like the PAWlidays were good to you and your humans. :) My two boys (Bichon) spent time with us but a lot of time with my mom and her three Bichons while we were up north visiting my Inlaws. Kinda glad the holidays are over, because that means less time apart from my beloved fluffs. 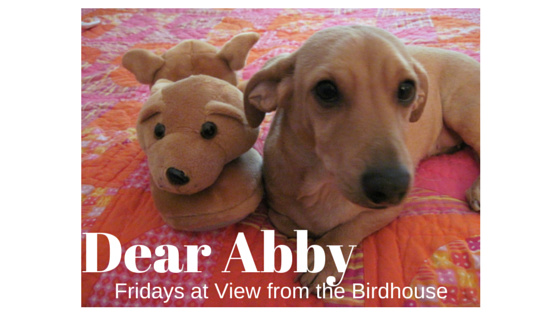 Thanks, Abby, for mentioning our Hug-A-Dog Harness! Sounds like you had a great holiday! My dogs shared a box of goodies from one of those subscription boxes, and they loved it. The exciting news is that I won a dog bed from another blogger, so I'm really excited to get that. Hi Abby! I love your new harness. It looks really pretty with your hair color. I would like to ask your advice about Charlie, my fur-baby nephew. He is overweight and his doctor said he must lose weight so he'll be able to walk instead of waddle. The problem is, Charlie hollers REALLY LOUD when he thinks he should have food and He won't quit hollering until his mama feeds him. How should his mama help Charlie cut back on food? Charlie's cries upset the whole household. Do you have any suggestions that I could pass along? Hi, Abby - I think you are absolutely adorable! Aw Abby you're adorable! I have "Momo", a Rat terrier foster fail and Sherlock, a Cardigan Welsh Corgi. They got a bunch of toys for Christmas, and I made them some doggy safe chicken to enjoy. They got plenty of cuddles too. Thank you so much for stopping by and leaving comments. It made me happy to hear from you! I loved hearing about your furbabies, too. Mary, thanks for the question! I am thinking hard about an answer for next week.